The Human Settlements: Delhi: Cars, cars everywhere, just no place to park. Delhi: Cars, cars everywhere, just no place to park. Water, water everywhere, not a drop to drink: Samuel Taylor Coleridge had famously written in his poem, The Rime of the Ancient Mariner. Were he to write on Delhi’s parking problems, he would have probably started: Cars, cars everywhere, just no place to park. True, the growing number of cars and finding a place to park them is one of Delhi’s biggest urban nightmares. It has also led to a host of other problems — traffic congestion, encroachments, no walking place, quarrels, road rages and even murders. Sample this: Parking has consumed nearly 10% of the city’s urban land and green and open spaces. In stark contrast, the share of the capital’s forest cover is just 11%. And it’s just not about a chaotic present. Worse is in store in the future. 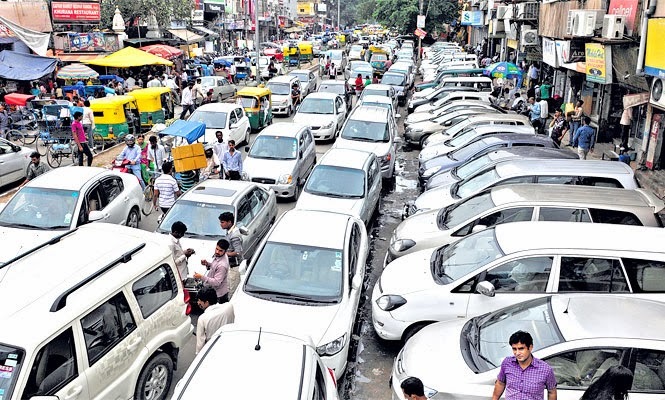 The constant addition of cars — 1.6 lakh are registered in a year — means Delhi needs an area as big as 310 football fields to accommodate them every year, studies at the Centre for Science and Environment (CSE) have shown. From 39.40 lakh vehicles in 2002-03, the number has risen to 74.38 lakh in 2011-12, an 88% increase. 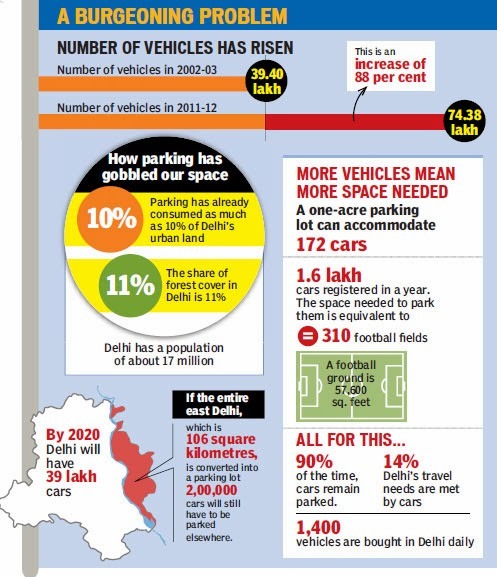 All this for cars that remain parked for 90% of the time, meeting only 14% of Delhi’s travel needs. About 1% of Delhi’s population of 17 million lives in Lutyens’ Delhi. This has pushed growth to the periphery and increased dependency on cars. Innovations such as multi-level parking have failed to provide any relief because of the long cruising time and lower charges in surface lots. Lack of adequate parking space also leads to all kinds of crimes. Last year, parking caused 27 cases of violence. 15 murders over parking have been reported in the last five years. In residential areas, service lanes of colonies are packed with vehicles and this leads to frequent fights. Residents suffer as emergency vehicles such as those of police and fire services often get stuck. Parking in residential areas does not cost a rupee. The absence of a parking policy due to lack of political will only add to the woes. The urban sprawl of Delhi has forced more and more people to use cars. This has led to the creation of a massive car-centric infrastructure. “Flyovers, signal-free corridors and overbridges obstruct and destroy movement patterns needed to promote walking, cycling and public transport. Even more people are forced to use cars...the vicious cycle continues,” said CSE’s expert Anumita Roychowdhury. The version of this article was first published in Hindustan Times. Images from HT Media.